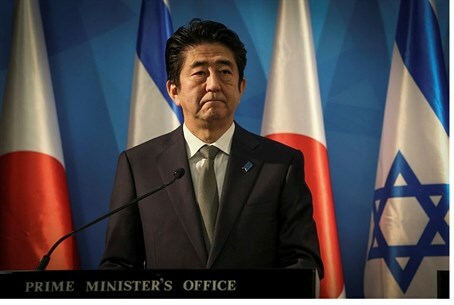 Before leaving Israel ahead of schedule, Abe outlines steps he is taking to confront ISIS threats to behead 2 Japanese nationals. Japan's Prime Minister Shinzo Abe vowed to stand firm Tuesday after the Islamic State (ISIS) terrorist group threatened to kill two Japanese nationals, saying the ISIS threats would not intimidate him to freeze a multi-million dollar aid package. His remarks were made several hours after the jihadist group released a video threatening to kill two Japanese hostages if Tokyo did not pay a $200 million ransom within 72 hours. An ISIS terrorist said in the video that the ransom demand is to compensate for non-military aid that Abe pledged in Egypt on Saturday to countries affected by the terrorist group's bloody expansion in Iraq and Syria. "Making threats by taking people hostage is an unforgivable terrorist act about which I feel strong anger," Abe told reporters at a news conference in Jerusalem, his words relayed through a translator. "I strongly demand that they not be harmed and that they be immediately released," he said. "The international community will not give in to any form of terrorism and we have to make sure that we work together," he said at the news conference, which started more than an hour late due to the crisis. And he said Japan's pledge of aid would not be affected, remarking "this $200 million package for refugees and displaced persons is absolutely necessary (for them)...in order to survive." "This position is unshakable, it is not to be changed," he said, stressing that the money was to help those made homeless by the conflict in Iraq and Syria. "We shall implement this steadily." The Japanese leader said two teams had been set up to handle the hostage crisis - one within the cabinet and one within the foreign ministry. He said he was sending State Minister for Foreign Affairs Yasuhide Nakayama, Japan's deputy foreign minister, to Amman in Jordan to speak with the government there and to gather more information about the situation. In parallel, Japanese-language media reported that Japan would be coordinating with related countries, including Turkey and Jordan, to try and secure the hostages' release. "I will take the leadership to solve this problem," Abe said. After the news conference Abe headed to the Palestinian Authority (PA) seat of government in Ramallah, Samaria, where he met PA chairman Mahmoud Abbas. He was to fly back to Japan later in the day, several hours earlier than scheduled.